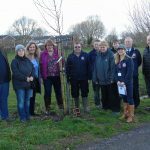 On Friday 16th March 2018 – members of the late Councillor Cliff Phelps family, Dodington Parish Council and Friends of Lilliput Park gathered to formally dedicate a tree that was planted in his memory. Cliff Phelps died suddenly last June – at the age of 96 years. He was still an active councillor at that time – attending meetings and representing the parish at other events such as Shopmobility Meetings and Dodington Parish Band AGMs. The dedication was led by Cllr Paul Hulbert – who as well as a colleague was a longstanding friend of Cliffs. 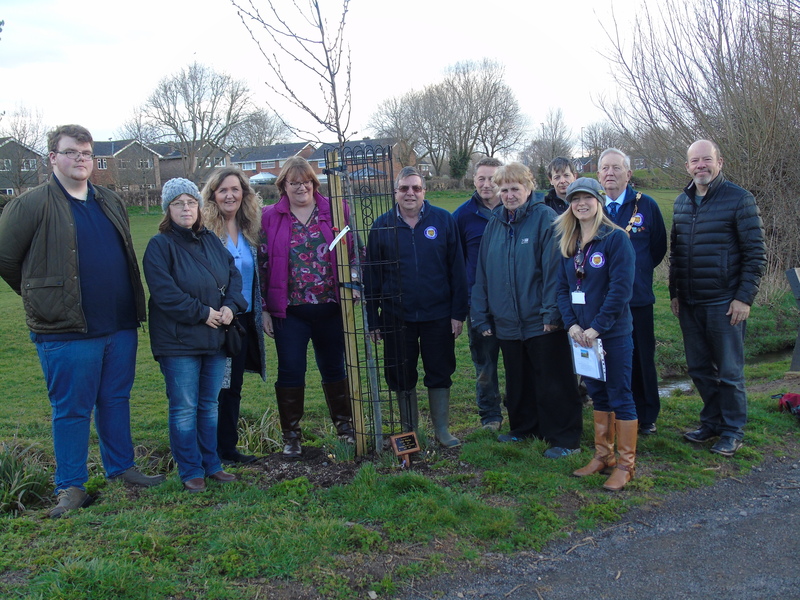 He stated that in planting the tree – a living memorial was being created for a remarkable man. After a moments silence – listening to the birdsong and gentle babbling of the stream a short poem was read by Clerk to the Council – Hannah Saunders…..and then as Cliff loved to do – the birds were fed by scattering lots of wild birdseed. The tree planted is a:- Malus × moerlandsii ‘Profusion’ – a striking pink-red flowered crab apple that is disease resistant and has flowers that are good for insects. The young leaves are a crimson-purple, deepening to a rich green as they develop. Good autumn colour.